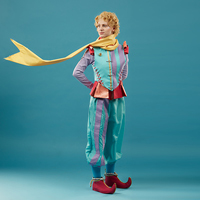 The Little Prince runs March 29-30. The Webster University Conservatory of Theatre Arts presents "The Little Prince" March 29-30 on Stage III. Written by Rick Cummins and John Scoullar and adapted from the book by Antoine de Saint-Exupery, "The Little Prince" tells the story of a world-weary and disenchanted aviator whose sputtering plane strands him in the Sahara Desert and a mysterious, regal "little man" who appears and asks him to "Please, sir, draw me a sheep." During their two weeks together in the desert, the Little Prince tells the Aviator about his adventures through the galaxy. The Little Prince talks to everyone he meets: a garden of roses, the Snake and a Fox who wishes to be tamed. From each he gains a unique insight which he shares with the Aviator: "It is only with the heart that one can see rightly." "What is essential is invisible to the eye."